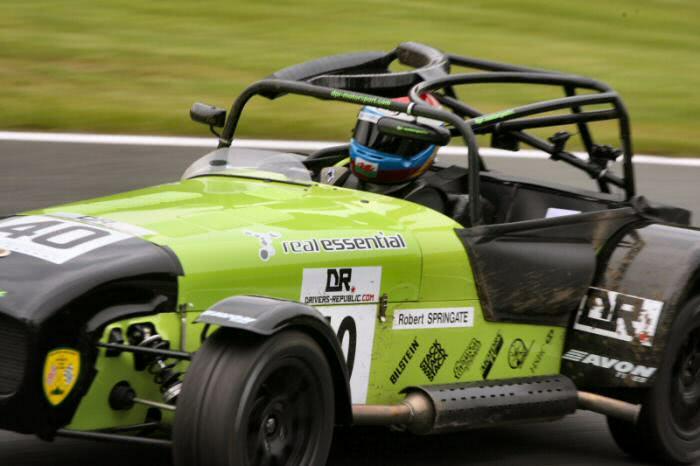 Caterham specialist DPR Motorsport & Robert Springate have secured Real Essential as their lead sponsor following Rob’s first Caterham Roadsport A victory at Oulton last Monday. Real Essential, run by former F1 No. 1 mechanic Vaughan Cartwright, has an established track record with its innovative resin-bead seat developed through solid relationships within motorsport including: F1, F2, A1GP, Historic F1, Formula Renault and Sportscars. The 21 year old from Bromley, Kent, scored his maiden win in what was only his third race weekend having made his debut at his home circuit of Brands Hatch last October. Rob works as a race technician for DPR Motorsport, assisting Team Principal, David Rowe with the race preparation and servicing the fleet of Caterhams, including his own. Rob commented: “Since I began driving Caterhams, I have only used 2-part expanding foam to make a seat infill for me. Working with Vaughan directly, I found time was on my side making the seat, so I could try various seating positions before deciding on which suited me best. I now sit much more comfortably and securely in the cockpit.